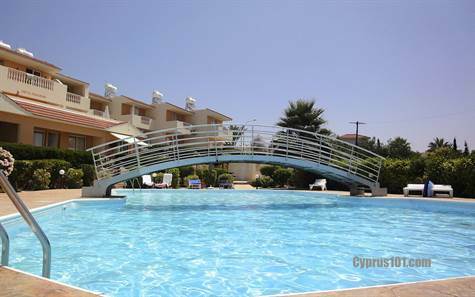 Peyia, Paphos - This delightful south facing one bedroom apartment is situated in a quiet sought after project in Lower Peyia, close to local amenities and the popular holiday resort of Coral Bay. The property features an open plan living room with well equipped end kitchen. Patio doors in the lounge provide easy access to a large covered balcony with stunning sea and mountain views. The same wonderful balcony can be accessed directly from the double size bedroom which has plenty of fitted wardrobes. The bathroom which includes bath, shower above and fitted mirror is modern with good finishes. The project is in immaculate condition and very well maintained. It has a stunning pool area with toilets and showers to the side and beautifully landscaped gardens. Please refer to MLS#: 1280 when inquiring.